Will the LASIK industry at least admit that they are responsible for "THINNING OUT CORNEAS" where years later they are beginning to "BULGE" which is a known long term injury called "Post Refractive Ectasia," caused by LASIK, (a procedure that wasn't needed in the first place!) Could this new CCL "Cornea Cross Linking" be their answer to stabilizing a "bulging cornea" from having been "thinned out" too much? How do we know that LASIK SURGEONS are responsible for ablating (removing) too much corneal eye tissue causing a condition called "Post LASIK Ectasia?" What is "Post LASIK Ectasia?" http://www.lasiksurgerynews.com/news/ectasia-post-lasik.shtml . LASIK and other refractive irreversible procedures. FIRST, is they create a "flattened-thinned" out cornea which does and always has had KNOWN LONG TERM INJURIES. Injuries such as "ablating away of vital corneal tissue," which is thinned out. Many are thinned out creating problems immediately or later on in life. Usually, the worse and more Myopic (nearsighted) your vision is, the more tissue they had to remove in order to flatten your natural shape, so you would most likely be more problematic immediately or later on Post LASIK. Did the LASIK CENTER explain this to you? NO, they didn't and won't. Because they know if they did, you would run out the door if you had half a brain and they would be out of business! SECONDLY, LASIK and refractive surgeries cause a loss of Keratocytes...and loss of vital Epethial Cells and it's important to note that each and every baby / person at birth is ONLY created with a certain amount of these and that's it. Did your LASIK CENTER explain what happens when LASIK diminishes these important and vital cells? NO, they did not did they! THIRD, did the LASIK CENTER take the one minute it takes, to explain what happens if and when your eyes change shape which is also a KNOWN FACT of normal aging, and how you will no longer be able to be fitted as a "NORMAL" patient, but rather you will now be labeled a "COMPLICATED CORNEA" or a "POST REFRACTIVE CORNEA" and that the only doctors who can treat you will be Optometrists who specialize in "POST REFRACTIVE CORNEAS?" Contact lens fitting Post Refractive surgery patients present some challenges to the fitter since the natural aspheric shape of the cornea has been altered. A normal healthy cornea flattens gradually from the apex or center out. Post Lasik patients are left with a plateau whereas the central 6mm (on average) is flatter then the untreated portion of the cornea. This is against the “Rules” of contact lens geometries and requires a different type of lens geometry and a more experienced lens fitter or physician. Not all fitters have the same skill set and traditional lenses typical will not fit properly nor provide the best vision on a post-surgical cornea increasing the time and expense. Post-surgical or “Specialty” lens fitting and contacts typically range from $700 up to $9,000 depending on the severity or irregularity of the cornea. Finding a fitter with the experience and relationship with a specialty lens lab can be challenging as there are no regulations or requirements for some to advertise themselves as a “Contact Lens Specialist”. At some point in life everyone will need vision correction. Typically this occurs in your forties when everyone will become Presbyopic or need reading glasses. So at best refractive surgery, if everything comes out perfect, only buys a window of time without correction. Because the LASIK INDUSTRY misappropriates and minces the term(s) downplaying the injury calling it "KERATACONUS....when the LASIK CLINIC should have told you the truth...that you have POST LASIK ECTASIA...and may need a CORNEAL TRANSPLANT!" Here's your proof that the industry knows there is a serious problem with the flap creation and ablation of the thickness of vital corneal layers inflicted for elective LASIK that was not needed in the first place! "If one looks for proof, one finds proof." There is overwhelming evidence that LASIK creates an unstable and forever weakened cornea if you continue reading until the bottom. So...wait a second! 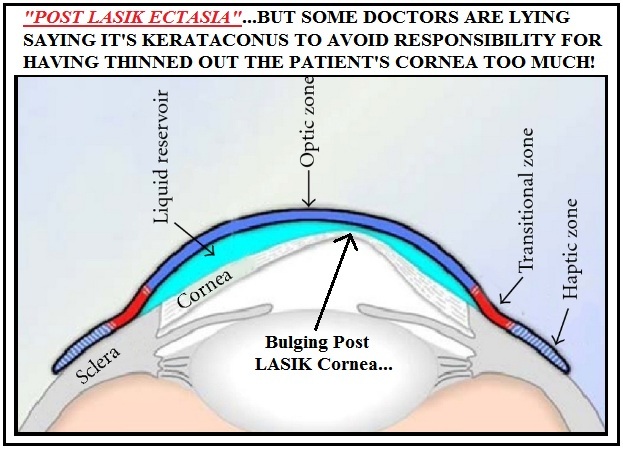 LASIK doctors are lying to permanently damaged LASIK patients in saying they have "Kerataconus" instead of telling them the truth that they have "Post LASIK Ectasia?" Yes. These lies, which are MEDICAL CRIMES, are happening by even the top Ophthalmologists and those that are in charge of the "SAFETY STUDIES!" (Notice Dan Durrie and John Kanellopoulos). Off Label Procedure: http://www.medscape.com/viewarticle/758172 . Completes $26 Million Offering: http://boston.citybizlist.com/7/2012/2/21/Avedro-Completes-26M-Offering--cbl.aspx . Canadian Approval For LASIK XTRA: http://eon.businesswire.com/news/eon/20120131005598/en/Lasik/LASIK/Lasik-Xtra . Avedro’s Ophthalmic Innovation Summit 2012/Avedro’s Presentation/Requires Password: http://www.ophthalmologysummit.com/pdff/avedro.pdf . Who is John Norris: http://www.yet2.com/app/global/en/html/eb7bio_norris.html . John Norris knows David Muller Well: http://www.reuters.com/article/2009/09/18/idUS112425+18-Sep-2009+BW20090918 . Shown on You Tube: http://www.youtube.com/watch?v=cKEcHGxitHU . Shown on You Tube: http://www.youtube.com/watch?v=ZD4csfIkFEs . Shown on You Tube: http://www.youtube.com/watch?v=eAF8UciNLXE . So you decide...is Avedro's CCL and Keraflex being used to treat the LASIK EPIDEMIC they first helped to create? Are Post LASIK Patients being told they suffer from Kerataconus when in reality they are suffering from "THEIR LASIK DOCTOR THINNING OUT THEIR CORNEA" causing it to be unstable, losing 98% of it's original strength, a flap that NEVER HEALS, and the worse part...DRY EYE that never goes away and gets worse year after year? Should David Muller/Avedro and others be investigated before too many innocent citizens become permanently injured, all while after they signed the physician's INFORMED CONSENT FORM, which protects the physician from being sued? Thank you for presenting the ramifications of LASIK in such a clear and concise manner. Before LASIK there was Radial Keratotomy or RK. Millions of patients around the world underwent this needless procedure and many millions are now suffering loss of quality vision and ocular comfort because of this surgery. Not a day goes by when I don't see a hurt post-RK patient. 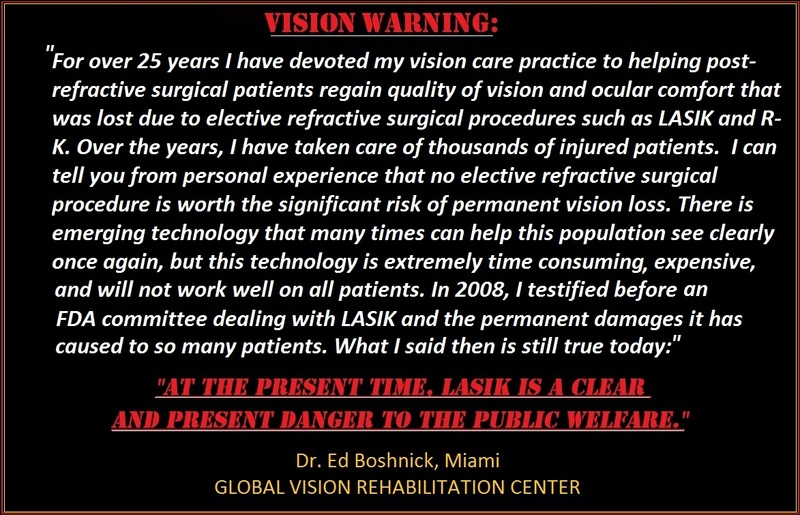 In the early 90's eye surgeons stopped doing RK when LASIK came about. When issues with the creation of the LASIK flap came about, we saw the arrival of PRK, CK, LASEK and a number of other refractive surgical procedures. All of these procedures present a significant risk of ocular and vision complications. To name just a few: permanent dry eye, reduced vision in low light, ocular pain, glare, halos and double vision. of patients who underwent refractive eye surgery just wanted to get rid of their eyeglasses and/or contact lenses. For the most part, these patients were doing well prior to their eye surgeries. The answer to these questions is money. To be more precise, Medicare and health insurance companies in the late 80's reduced payments to eye surgeons for many procedures, especially cataract surgery, the most frequently done surgery in North America. Combine this fact with the explosive growth of managed care ( HMO'S, PPO'S etc.) and you had a situation where eye doctors' incomes were being dramatically reduced. Eye doctors were being forced to see more and more patients per unit time at reduced fees. This fact is the reason for the introduction and aggressive advertising of not only refractive eye surgery but a host of elective surgical procedures such as Lipsuction, plastic surgery, botox and so on. One must also appreciate the fact that doctors hold an unusual position of trust in our society. When a doctor says to a patient that he or she would be a great candidate for LASIK and that this patient will not need to wear eyeglasses or contact lenses ever again and that there is virtually no risk involved, the average patient will believe this doctor unconditionally. They are asked to read the informed consent and when asked about some of the complications that may occur, so many of these patients are told that this is a formality and that this particular doctor has done so many procedures that no adverse complications has ever been encountered in that office. Of course, we now know that this was aggressive marketing by commissioned "handlers" and a lack or ethics on the part of the eye surgeon and the people around him. Thank you for taking the time to read through the various Anti-LASIK Blogs that continue an "ALL OUT EFFORT" to stop innocent families from being slaughtered and destroyed because LASIK quacks continue to abuse the medical oath they swore so long ago. You're a real doctor, you help "SICK" people try to become "HEALTHY" again. They are exactly the opposite...luring, deceiving and lying to patients, in a criminal manner, and making "HEALTHY" eyes becoe "SICK and DISEASED" in order to make a living. What upsets all of us the most (you estimated MILLIONS now injured from unnecessary procedures like LASIK), is that they will do ANYTHING and saying ANYTHING for money...and do NOT CARE about the very patients they are PERMANENTLY INJURING...they know that we all have to come back to them, and be hooked in for life, since they took our perfectly healthy eyes and induced disease/sickness. Where is the FDA? Where is the FBI? Where is President and the First Lady? Where is Congress? You can't help but think, that they are all in it especially after the hundreds of times we have brought it to their attention and Dr. Waxler, who approved LASIK did as well, and is now being IGNORED... If he wasn't being ignored, that's one thing. But he's being ignored after serving 26 years for the FDA, because he's now speaking out against LASIK as shown within this blog. Anyway, many thanks again for providing a lifetime dedicated to "HELPING" patients become "HEALTHY," instead of what the LASIK industry is doing which is quite the opposite and illegally criminal in nature. Thank you for sharing this article! 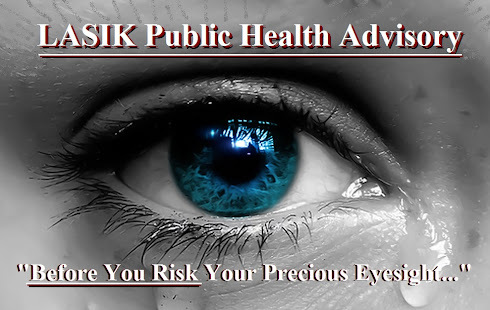 for it absolutely was terribly informative, that is several readers might be a lot of experienced the potential risks of LASIK surgery and at constant time, this text might warned individuals from potential risks of undergoing to the current quite surgery. Dear Dry Eye Laser San Diego: Thank you for commenting. As you probably already know, anyone now can walk into any drug store and see the infinite and prevalent "DRY EYE BOTTLES" that clearly now state on the front center: "FOR LASIK DRYNESS." LASIK has now become an epidemic! An unecessary irreversible eye reshaping procedure, that wasn't even needed in the first place! Taking perfectly clean, healthy, and functioning eyes and inflicting them with permanent flaps that never heal, losing 98% of the tensile strength that keeps the eyes shape "regular," as well as causing permanent DRY EYE DISEASE. Where are the handcuffs to take these doctors away and put them in jail for "COOKING THE SAFETY STUDIES?" Such a very nice blog Intralase Lasik. Your article is very useful for me and keep sharing these types of things Thanks. Come on Lasik Advisory check out who you replying to. 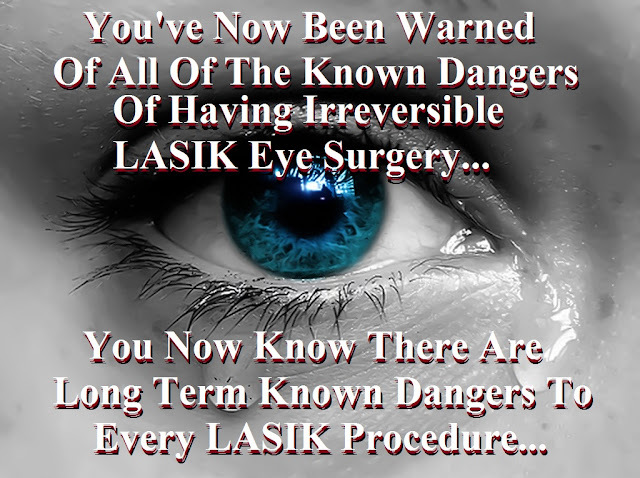 Lasik Revision San Diego and lasikturkey.net are both LASIK SURGEONS! Lasik Revision is Michael Tracy and lasikturkey.net is some Lasik place in Turkey! Have fun butchers! Real Funny, so cheap you can't even afford your own advertising.